Our New York-trained chefs bring you the freshest selection of fish, creative rolls and signature appetizers and entrees. All our food is presented with a stylish presentation at an affordable price. Open for lunch and dinner, 6 days a week, visit Hanaki Sushi for the finest in Japanese dining. Please see our menu for pictures of our culinary delights. As a person who travels frequently for business, I have had the opportunity to try many sushi restaurants all over the country. Each area generally has a restaurant that stands out and that restaurant for Hampton Roads is Hanaki Sushi. Hanaki has the freshest fish, creative rolls and wonderful specials that make it among my favorite restaurants in the country and best of all, it is right here in my backyard. The prices are excellent and Vincent and Jessica Chen do an outstanding job creating a welcoming atmosphere with the highest standards for food and service! 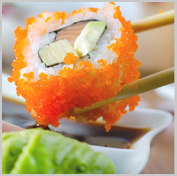 Hanaki Sushi is Hampton Road's premier Japanese restaurant. Perfect for weddings, graduations, birthdays, anniversaries.